Happy December! We hope it’s a good month for you, despite the fact that you’re likely dealing with a bunch of holiday-related stress. Or finals, maybe? Man, we’re so frigging happy we don’t have finals any more. Wow, like the working world has its own problems obviously, but finals were the wooorst. Speaking of the worst, today’s Nerd Watch is a bit later than we’d like it to be thanks to the magic of *migraines*. Speaking of how migraines are the pits, have you checked out Hannah Shaffer’s brand-new Kickstarted game “14 Days“? It’s about migraines and how people deal with them. Speaking of Hannah Shaffer, have you heard the news? She’s presenting tonight at Nerd Nite NoHo, the most important and entertaining event in all the month of December! She’s going to talk about RPGs, which are good times and also slightly intimidating. Also presenting: Pat King! Pat King is a game designer, and he’s going to talk about his experience creating a VR music video thing called “The Vanishing Point” that is super nifty. This holiday season, don’t be a danged fool! 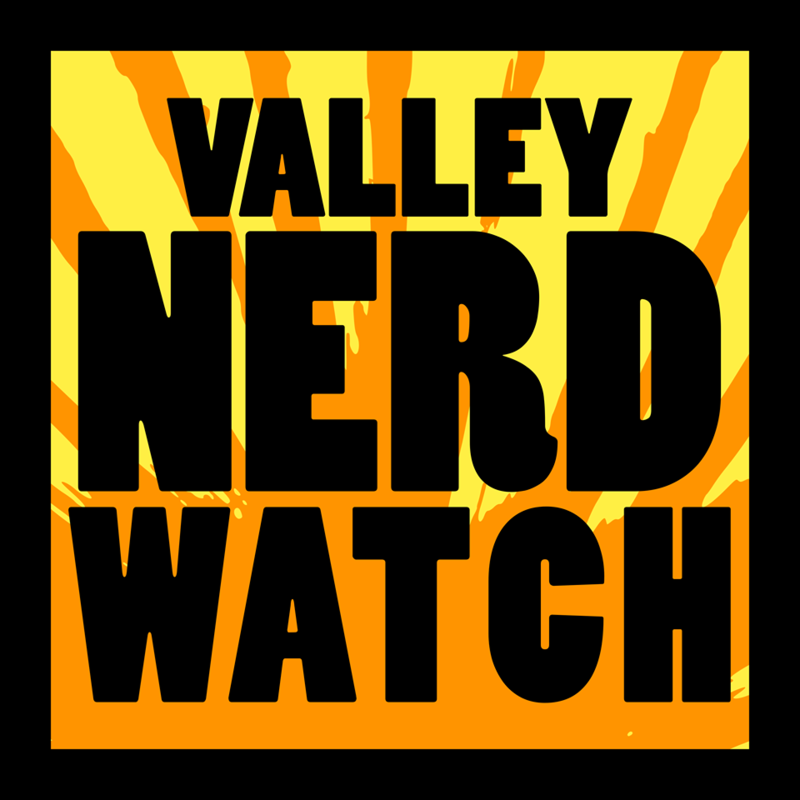 Check the Valley Creators list to find out which local notable nerds you can support via capitalism! You can also send them a kind card or something, but we’re almost certain they’d appreciate your hard-earned cash as well. There are a ton of people on that list! You’ll find gifts appropriate for friends and family of all ages and interests. You’re welcome. Finally! A chance for the Saga of the Ice Masters to reach a wider audience! The 45-volume series you wrote over the month of November is brilliant, we all know that. But it still hasn’t received the recognition it deserves. Take your brilliance to the masses by reading selections at this event coordinated by Forbes Writer in Residence Naila Moreira! Hey are you into Runes? Well, who isn’t nowadays? The only way to become more powerful in the art of Rune Casting is, as we all know, developing a unique artistic style to allow for more complex Rune Combos! Learn to use the power of art journals to lay waste to your enemies in this unique course hosted by a talented and experienced artist! Delightful! A lovely party for a dark time of the year. This particular party features all day open gaming, as well as demos of Kings of War and a raffle from the venerable 131! Off the Wall Games [41 Russell Street, Hadley, MA 01035] at 12:00 – ??? We played the BattleTech RPG two times. We made characters the first time, we fought once out and once in mechs the second time. It still sticks in our head for how intense it was. Our favorite part? The fact that our character lost all four of their limbs over the course of their career in accountancy, thanks to some bad dice rolls in character creation. Anyway! Alpha Strike seems cool, learn to play Sunday afternoon! So hey Enterprise was a pretty terrible show, right? But people generally seem to have positive feelings toward some of the later Temporal Cold War stuff! This Attack Wing tournament will see you trying to keep a raging battle away from the surface of an… EXPLOSIVE PLANET? There’s a $15 entry fee, which gets you a booster and a chance for prizes! Bring a 90sp starting build, to which you will add the booster pack! Michael Klatsky (VP – Systems at Esperdyne Technologies, LLC in Hadley voted “name most indicative of likely contribution to some sort of sinister alien takeover of Earth: five years running) is going to join to talk to people about how to use Docker effectively! Join up at the Meetup to find the location! Drupal! A useful web design framework that you probably are using or interested in using. Come talk to a bunch of people who also work with Drupal about your own work and how to solve problems and all that jazz! Fun and useful. Ah, the Holidays. A time for togetherness in the face of the darkness and dreariness of our Temperate Zone winter. The Last Call Media team invites one and all to a nice party the… same day the new Star Wars movie comes out. Hm. Might be low attendance. So hey one cool thing about the area is that Doodle Studios in Connecticut does a metric crud-ton of LEGO animation work! It’s pretty cool! You’ll get a chance to meet Elizabeth Popolo, an animator for Doodle who’s going to show off some of her work on LEGO Star Wars animation! She’ll also have a Q+A afterward! And there are trivia questions and prizes! The best night to prep for The Force Awakens! Jedi training! Children ages 7 and up can come test their mettle! First, you make your own Light Saber and Star Wars crafts, then test your skills against the Jedi obstacle course! Costumes are welcomed and encouraged, registration for the craft portion is required! Ahhh, the coolest of the Tim Burton filmography. Also, the one that struck some inexplicably strong chord with that one friend of yours and caused you to watch this 43 times in high school. But it’s been a bit since High School! Watch it again at the beautiful Forbes Library! Dungeons? Basically like basements, only with a lot more stuff and sometimes cults. Dragons? Ever had a pet lizard? That’s the basic scope of it, but they like gold instead of heat lamps and rocks. This is a 5th level adventure that you can join at any session! The GM, Neal Robinson, will show you a great time. Beyond having the most charming host in the universe, Nerd Nite this month will be a really neat time with two charming presenters. First we’ve got Hannah Shaffer, talking about coming to RPGs as an adult player and designer, and then we’ve got Pat King, talking about an awesome VR music extravaganza he made! There’s a $5 ticket, but in exchange you get a great rocket stamp.